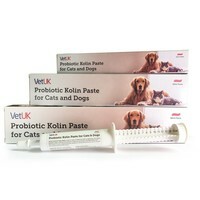 VetUK Probiotic Kolin Paste for Cats and Dogs is a palatable paste for use in cases of digestive upset or diarrhoea. Probiotics – Live microbial supplements to maintain a high level of beneficial bacteria, balance micro-organisms in the intestinal tract and combat bacterial overgrowth. Prebiotics – Provides nourishment for the probiotic bacteria. Bentonite Clay – A natural binding agent to help firm up the faeces and aid in the resolution of diarrhoea. The paste is presented in an oil base so that the bacteria are only activated once swallowed. Really good value for money, much much cheaper than the vets, highly recommended, easy to administer. I CANNOT RECOMMEND THIS PRODUCT ENOUGH!!!!!!!!!! My German Shepherd has had an easily upset tummy since I brought him home at 8 weeks old. Before I tried this I was using a vets only probiotic paste which rarely made a difference & meant having to resort to antibiotics. I have used VetUK Probiotic Kolin Paste at the onset of the last 2 episodes & it has stopped the problem in its tracks! I will never again be without this product in my dog's first aid box!!!!!!! My Choclate Lab will eat anything and everything from bread, people put out for the birds to my own cats food if I let her and she does suffer with an upset tummy. But this Probiotic Kolin Paste does settle her tummy down. I would not be without now, she likes the taste and there is no problem with getting her to take it. Absolute miracle. Never failed to work. I'm sure my dogs appreciate it, I know I do. Really easy product to use and great for calming an upset tummy. Much cheaper price than at my vets as well. Thank you VetUK! I use to purchase this from my vet for double the price, I have found this to be just as effective. Such a great find, will continue to use this and recommend to all my friends! I have been using this product for a few months now and don't know what i'd do without it. 100% success in calming an upset tummy!!! Very highly recommended. I have used the Protexin version of this product for a number of years, and as the VetUK product was cheaper I thought I would give it a go and I haven't been disappointed! A good new product! A really easy to use product that gave fast results! Exactly what you need when you have a dog with an upset tummy!